When it comes to thyroid cancer, is less more? Researchers at the University of Pittsburgh Medical Center (UPMC) aim to answer this question with the first-ever prospective clinical trial to test whether molecular profiling can enable tailored, thyroid-preserving surgeries instead of total thyroidectomies by preoperatively identifying nonaggressive, low-risk thyroid cancer cases. In addition to reducing the risk for surgical complications, removing only half of the thyroid, also referred to as a lobectomy, may leave enough of the butterfly-shaped gland intact to avoid the need for daily hormone replacement therapy. 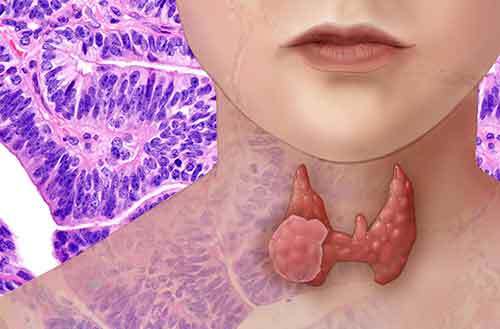 The study will implement ThyroSeq v.2, one of several molecular profiling tools on the market designed to identify the genomic signatures of thyroid cancer. Initially developed by a scientific team lead by Yuri Nikiforov, M.D., Ph.D. at UPMC, ThyroSeq is currently used to predict the risk of thyroid cancer in a subset of patients, which accounts for approximately 20% of all biopsies, where conventional cytology cannot differentiate between malignant and benign thyroid nodules. The latest version of ThyroSeq uses next-generation sequencing to test fine needle biopsies for the presence of 42 different thyroid cancer-associated markers across 14 genes. “As we become more experienced with these genetic markers, we’re getting more information about the biologic behavior and disease characteristics of tumors, and we’re seeing genotype-phenotype associations—certain genetic signatures that seem to be associated with certain cancer phenotypes,” remarked the principal investigator of the trial Linwah Yip, M.D. Dr. Yip and her colleagues saw these emerging genotype-phenotype associations as a potential answer to a multitude of questions prompted by new guidelines released by the American Thyroid Association (ATA) in 2015. In contrast to earlier editions, which recommended complete thyroid removal for virtually all cancers, the latest edition advocates less aggressive treatments for low-risk cancers, including removal of only half the thyroid, and less frequent use of radioactive iodine treatment. One reason the new guidelines emphasize less aggressive treatment for low-risk cancers is that the discovery of small cancers found incidentally during imaging studies performed for unrelated reasons have caused a dramatic rise in the reported incidence of thyroid cancer over the past 15 years. “In many cases these small tumors would never be clinically apparent to the person. They would live out the rest of their life and never know that they had thyroid cancer except that it was incidentally found on some imaging study done for another reason,” explained John Morris, M.D., ATA president. Of course, not all thyroid cancers exhibit such a benign temperament, but how do you tell them apart? According to Sally Carty, M.D., professor of surgery and co-director of the UPMC/University of Pittsburgh Cancer Institute Multidisciplinary Thyroid Center (MTC), the risk factors the ATA uses to guide treatment options are based on, with one or two exceptions, tumor histology performed on the thyroid nodule after surgical removal. “It really puts the surgeon in a bind, because you don’t know, based on current guidelines, what operation to recommend—a lobectomy or a total thyroidectomy,” said Dr. Carty. As a result, more patients with aggressive thyroid cancer may have to endure the additional hassle, cost, and risk of undergoing a two-stage surgery—an initial lobectomy followed by a second surgery to remove the remaining thyroid gland tissue. UPMC’s two-year clinical trial, funded entirely by philanthropic donations from families affected by thyroid cancer, could help achieve the ATA’s goal of reducing unnecessary treatment while also avoiding the necessity for multiple surgeries. “If we could cut the healthcare dollars spent on unnecessary thyroidectomies, [we would achieve] a wonderful goal,” remarked Dr. Carty. The American Cancer Society predicts that 56,870 people in the U.S. will be diagnosed with thyroid cancer this year. For low-risk patients, better molecular markers could translate into fewer thyroidectomies, less hormone-regulating medication, and less long-term follow-up care, which means a lower financial burden for thousands of families affected by thyroid cancer—proving that sometimes less really is more.